as a mentioned in my last post, i wasn’t in an actual shop in months which super odd for me and it makes me a bit sad. i love myself some retail therapy and after spending my days in uni i got an e mail from mac telling me that rihanna came out with another collection with mac and i felt like treating myself a bit so i went right ahead and ordered myself one of the lipsticks. i adore mac lipsticks and love my tiny collection that i’ve build up over the last year and was really excited to add a new one to my collection and i’ve never shopped any limited editions from mac, so that was even more exciting. first off all, lets take a moment for the packaging. 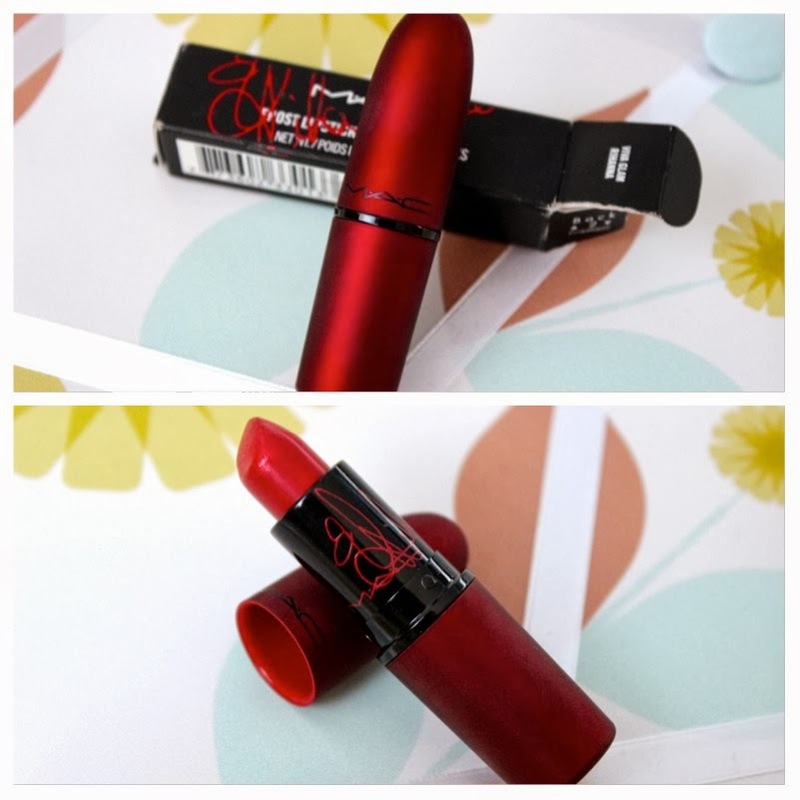 unlike all the other mac lipsticks its a red packaging which is matte and almost feels like like velvet. it looks so super chic and is just such a joy to look at. i just have it sitting on my vanity all the time to look at it because its so different from all my other lipsticks and i do own a lot. i feel like its really rihanna looking if that makes any sense. onto the color. it is a red which is more on the lighter side with warm toned shimmer to it. it wasn’t too sure about the shimmer because it is quite obvious but on the lips its just shimmery and super lovely. it is a frost but i don’t really know whats the difference between a frost and a creme sheen but this one does actually look quite frosty. its shimmery and a bit more sheer than a matte lipstick by mac but still super pigmented and it feels super lovely on the lips. at first i wasn’t quite sure about the color because rihanna is quite tanned and i’m super pale but this color looks so lovely on the lips, its more laid back and perfect for every day make up because its spices up any make up without being an “in your face” color. its just super lovely and its actually available again so get your hands on it as soon as you can. the only down side of this lipstick is the matte packaging. it gets dirty really easily. thats probably the main reason why i still have the actual box. i just don’t want it to get dirty. i hope you enjoyed this little review of my new mac lippy. i just love that brand so much but i love you more.